This journey is truly the most rewarding way to travel from Kibuye to Gisenyi. Paddling through the deep azure waters of Lake Kivu’s ‘Bay of Islands’ we island hop past many uninhabited islands – including Napoleon island with its famous bat colony. Our first night is spent camping on another beautiful, uninhabited island, which is still mostly covered with natural woodland and so teams with birdlife. Quietly continuing up the coast, we stop next at Kinunu, where there is a small guesthouse and a wonderfully romantic lodge set with breathtakingly scenic views. Our final stop is at Cyimbili – where we can witness the full lifecycle of Rwanda’s famous coffee, from islands covered with bushes to a cup of delicious coffee. Our last day will see us approach Gisenyi where we often get a superb view of the active Nyiragongo volcano. noisy) colony of thousands of fruit bats that fight amongst themselves for the best roost. It’s then just a short paddle to our campsite, on another beautiful uninhabited island that is still covered with native trees that provide a rare haven for numerous species of birds dart in and out of the foliage. With exclusive access on the island, we set up camp, maybe buy fish for dinner from local fishermen – so supporting a local community – and cook our own, simple but delicious meal, which we can provide for you, around a small open fire. Please note that - unless otherwise arranged - there are no facilities on the island, so this is amazing 'wild camping' at its best. Then in the silence of the lake, the following morning, we wake to a dawn chorus that is truly remarkable. Day 2: After a simple breakfast, we have an easy paddle along the coast to Kinunu. We arrive in time for lunch, so in the afternoon, we take an optional trip around Bugarura Island, one of the largest Rwandan islands in Lake Kivu. We can land on the island to see its church, old mosque and open market – but what's special is that it offers what is perhaps the most scenic, panoramic view on the whole of Lake Kivu. Day 3: We have another gentle paddle to today as we meander gently along the shoreline soaking up the quiet and beautiful scenery. Near Cyimbili we find lovely views of the coffee islands from the water and can optionally go on a short paddle around them in the afternoon. Cyimbili is special because here you can see the full life cycle of coffee: you watch – and even help with – the entire process from seeing coffee beans growing on the bush to a delicious cup of locally grown and roasted coffee. The guest house is run by Alarm-Rwanda that is promoting reconciliation in the local community. They also sell their excellent coffee! Day 4: We are now in sight of the active Nyiragongo volcano that looms large ahead of us all day. We sometimes stay close to the shore however, if the weather is good, we occasionally paddle out deep into the lake to get the best views of the volcano as we slowly make our way to our destination at Paradis Malahide. We can make reservations for you in Cyimbili and Kinunu, however, accommodation and food as well as any additional activities are not included in the price charged by Kingfisher Journeys, except where specifically mentioned. You will need a tent and other camping equipment on the island, which can be hired from us, or you can bring your own. There is also a camping fee on the island (included in the price above), separate to the tent hire. We will loan you free dry bags for your clothing and valuables. Sunset and fishing boats at dusk: Included for free - we can finish one of our days on the water in style by witnessing the best spectacle on Lake Kivu. Packed Lunch for the first day: It's important to bring a lunch as there's no-where to buy anything to eat once you're on the water. Camping equipment hire: for use on the camping island. If you deselect this option, you will need to bring your own tent and other equipment. And they must be small enough to fit inside your kayak. Dinner on the camping island: we prepare for you a delicious simple meal on the open fire. If you deselect this option, you will need to bring all your own food and cooking equipment. Kinunu: Accommodation reservation only, subject to availability. Cyimbili: Accommodation reservation only, subject to availability. Luggage transfer: we’ll arrange for your bags to be transferred to the destination hotel at the end of your journey. 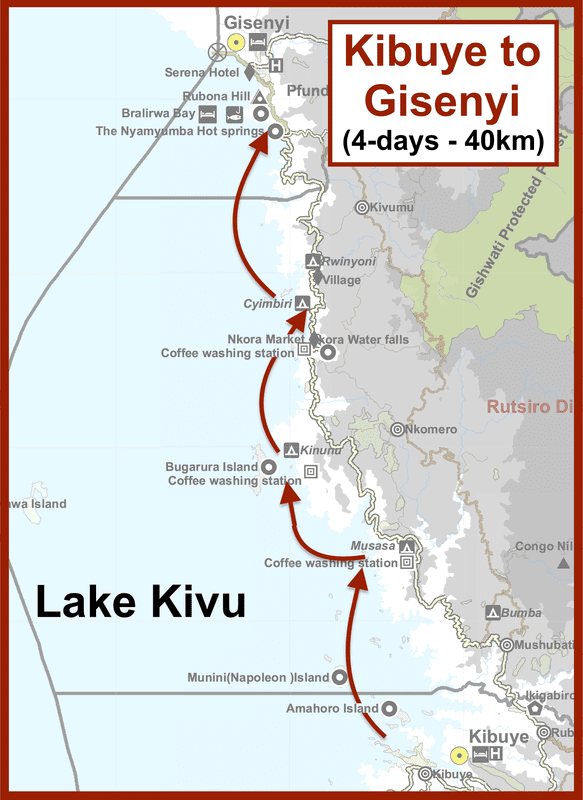 Please see kayaking on Lake Kivu for details about timing and what to bring and the details about the accommodation and places we stay.